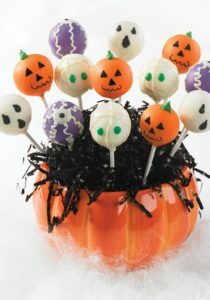 I think these cake pops are adorable and since it’s the season…. So hook em up and enjoy your Halloween! 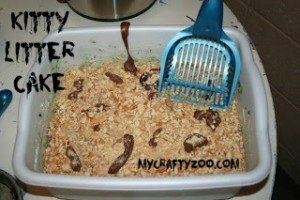 Some of you may remember catching my review of the 175 best Baby Cakes cake pops recipes (find it here). This one was my fave Halloween centerpieces! Here goes. Be sure and check below for more Halloween fun! Melt 1/4 cup white candy melts and use to attach sticks to 6 cake pops. Freeze cake pops for at least 15 minutes to set. Repeat with orange and lavender candy melts, using each color to attach sticks to 6 cake pops. Add 1 cup white candy melts to those left in the cup and melt until smooth. Coat the cake pops secured with white candy melts. Set in a cake pop stand to dry. Repeat with orange and lavender melts, 6 per color. Melt 1/4 cup green candy melts. Use a pastry bag to pipe a pumpkin stem onto each orange cake pop. Set in the stand to dry. Pipe two green eyes onto each of the 3 white cake pops. Set in stand to dry. If you like this recipe and would like more, you can order yours here. I’d love to see pics of your creations! Excerpt published with permission from 175 Best Babycakes Cake Pop Maker Recipes by Kathy Moore & Roxanne Wyss © 2012 www.robertrose.ca Reprinted with permission. All rights reserved. Very cute, and it looks tasty, too.